I was thinking about how PLM balance product lifecycle from the standpoint of producing and consuming product data. The product development process, obviously starts from product design, engineering and manufacturing. However, when manufacturers need to ship their product, they need to provide a significant amount of product technical and service information. It made me think about some historical parallels. So, I came to the invention of Johanes Gutenber. 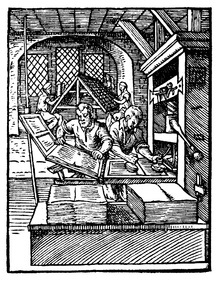 Wikipedia: Johannes Gensfleisch zur Laden zum Gutenberg (c. 1398 – February 3, 1468) was a German goldsmith and printer who is credited with having introduced modern book printing into Europe. His probable invention of mechanical movable-type printing started the so-called “Printing Revolution” and is often regarded as the most important innovation of the modern period. It played a key role in the development of the Renaissance, Reformation and the Scientific Revolution and laid the material basis for the modern knowledge-based economy and the spread of learning to the masses. Take few more minutes to watch this video about Gutenberg technology and revolution it created. The following video fragment shows the original Gutenberg process using Gutenber Press. It was a real revolution back in 1300s. Now, let’s move to 2000s. Google Books seems to me as a new Digital Gutenberg. The combination of Books availability and printing on demand can create a future of digital and printed information delivery. Take a look on the following video and compare it with 1300s invention. Getting back to our PLM land… PLM software vendors recognized the opportunity of digital product information delivery. It resulted in several acquisitions in the PLM world. Take a look on few examples from PLM companies related to the technical documentation and service information delivery. What is my conclusion today? To consume product information and technical documentation is not less important than produce it. In my view, the consumption story is in a very premature state. We produce a lot of information about product. However, the process of technical documentation and other service information delivery is broken. In my, there is an opportunity to fix it. I’d be interested to know about various examples and your experience in this field. Okay, I know that Cortona3d really not made by Siemens PLM Software. But when I asked in Siemens for “composer analogue” they said me about Cortona3d. So I made conclusion that Cortona3d related to Siemens like 3d via related to DS. Is it right? 3d via composer not support direct working with UG-NX data now :(. I believe that Cortona 3d do. Yes, I know something about 3d via composer ;). As you can remember, previous place of my work was DS’s VAR 🙂 And supporting NX via STEP is not acceptable for me. Oleg, it will be very interesting to ask Siemens’s guys about affiliating with Cortona3D. I asked Nik Pakvasa (@pakvasa) from TC and hope to have his explanations about that. Here is Nik’s answer: Cortona3d is Siemens PLM partner. The product is integrated with TeamCenter.